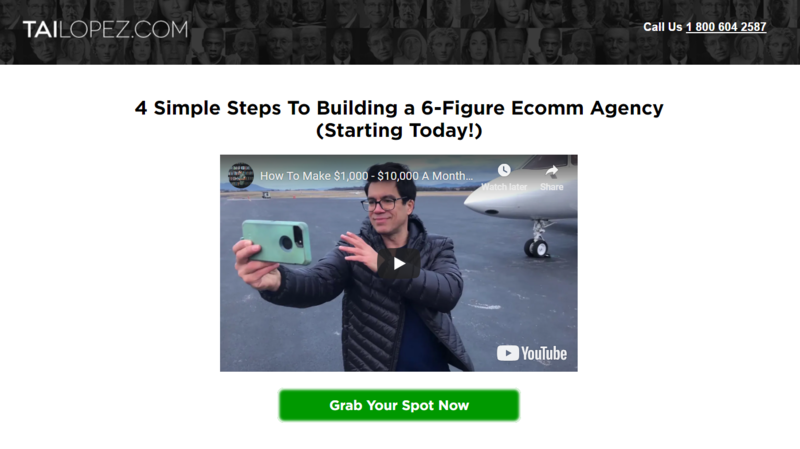 Tai Lopez’s new program called Ecomm Agency is something that he says you can make $1000-$10,000 a month with… all online. Sounds awesome, but is it really true? Or could potentially be a waste of time scam that is just going to leave you disappointed at the end of the day? You came here looking for a third-party review and I’m going to give you exactly that. And by the way… I am in no way affiliated with this program so this review should be as unbiased as possible. I’ll be giving a general overview of the program, talking about the 4 step process, the cost, and my opinion on whether or not it is worth joining. You probably the promotional video on his website or maybe on YouTube, titled How To Make $1,000 – $10,000 A Month Helping Business Set Up Their Ecommerce. You know… The one that starts out with him showing off as usual, by getting on his private jet and then filming the rest of the video at thousands of feet in the air as he enjoys is very own private luxury flight. But that’s just the way he does things. Tai is always showing off his riches and, while many people don’t like how he does this, it works because it attracts a lot of people to his videos and then to his programs, which he makes a ton of money off of. 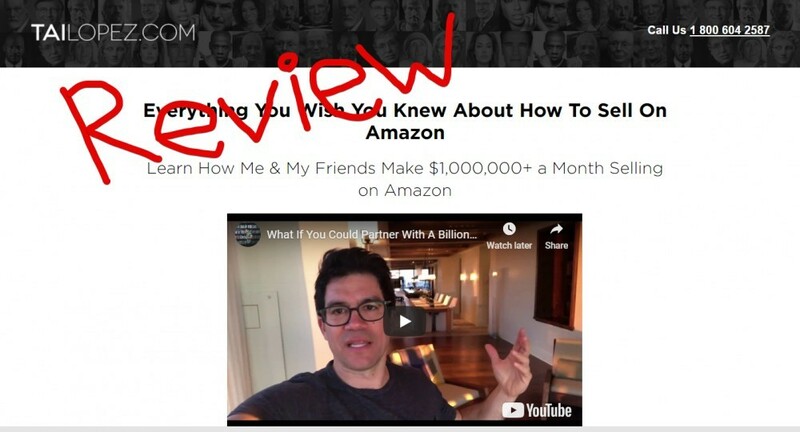 This particular program is all about, as the video title suggests, helping businesses set up their e-commerce stores, and can be found on his official website tailopez.com. In a nutshell, you will be providing the service of improving outdated and ineffective e-commerce stores and potentially making big bucks doing so. Obviously you are going to have to find businesses that are selling products people actually want. There needs to be a demand or else there is no hope of that business, no matter what you do. Some other criteria that the “right businesses” must meet is that they must have a crappy website and not be active on social media. This gives you the perfect spot you can slip into in order to help them out. Then you are going to want to contact the business. Tell them what you noticed and how you can help them. There are scripts that are provided for you that you are able to simple copy and paste into emails for this. You want to make sure the email sounds professional and not like a bunch of spam. Having a few websites myself, I am very aware of all the spammy “hey let me help” emails that online business owners get. A lot of times I only read like half of the first sentence and then delete them… so they need to be good. Tai also mentions that you want to charge at least $1,000 a month for your services, because charging too little makes you appear as not that great. There are different ways you can go about improving their ecommerce website but one of the easiest is to use Shopify. It looks great, there are lots of plugins available that can help boost conversions and it will make you look like a pro…. even though it’s a super easy ecom site platform to use. With this step Tai is talking particularly about mastering the use of social media to drive more sales to their new and improved ecommerce site, which you just helped create for them. I’m guessing that you probably already know a little about Tai Lopez… who is without a doubt a master of social media himself. Ya he likes to brag and show off all his fancy cars and mansion all the time… but guess what? That is why he has such a massive following online… he knows how to lure people in. So as I’m writing this there is supposedly a small opening for a few hundred members to join as a “test group” for only $49. *Price might have changed by the time you read this. The normal price is supposedly $697…. but is this really true? I’m sure you are well aware that it is a common online marketing tactic to set a discount that doesn’t really exist, just to make the offer seem more appealing. So is he tricking you? Honestly I highly doubt it. Tai has done this kind of thing with some of his other programs in the past. And this is how he makes his money to afford his mansions and sports cars…. so do you think getting a few hundred people to join for $49 is going to get him all of that. There is no doubt in my mind that this is a business model that could potentially be very lucrative. I have seen plenty of outdated and overall low-quality ecommerce sites that probably aren’t making near as many sales as they could be. These are the opportunities you can cash in on. Now sure…not everyone is going to take you up on the offer and you are probably wondering why anyone would since you have never done this, but Tai is giving you the templates to come off as professional so that you look like some ecom veteran. It’s all about presentation and how you appear. I know some people are going to be asking it so I’ll tell you that I definitely do not see this being a scam in any way. There is no way that Tai is going to tarnish his name and reputation by putting out some crappy scam program that is going to get a lot of complaints and bad reviews. He has put out a number of different programs in the past focusing on various aspects of online business, as well as off-line, and he always over-delivers on his promises. If there is something that he may be doesn’t have much knowledge on personally, you will bring in an expert to teach training on. I would not worry about this being a scam or not being worth the price tag by any means. I’m sure there will be plenty of value provided. The question you need to ask yourself is whether or not you want to be involved in this type of business. Do you really want to go around contacting dumpy e-commerce sites and providing the service of improving their site as well as their social media presence? If the answer is yes then this program is definitely worth considering but if you cannot see yourself doing that then there are other options out there for you. I hope you enjoyed this quick review and maybe got a little bit of insight from it. If you are a beginner looking to make money online be sure to check out THIS POST that explains how I make a living working online and how I help others get started doing the same. It seems that about half of the “make money online” opportunities out there have to do with Amazon in one way or another. But you have to be careful with what you get involved in because many of them are scams and actually have little to nothing to do with the Ecom giant Amazon. Is Amazon Secrets (at AmazonSecrets.net) just another steaming pile of BS like The AZ Code for example…or is this the real deal? I have been seeing a lot of people asking whether or not Amazon Secrets is a scam so in this review I’m going to answer that question for you. If you are new to this all there is a lot you need to know. In this review I will be going over a few important things that you are definitely going to want to know before hand. But anyways… The guy says that he has some free training videos that he wants to share with you. According to him there is this “inner circle” group of people that he has been training to make money selling products on Amazon and he is now opening up this opportunity to 100 new people. Now whether or not this limited availability is really true is something that I don’t know, but I will say that I do often see false scarcity tactics used when there really are not limited positions. I just reviewed an Amazon related scam the other day called Amazon Cash Websites that used this same tactic. The two guy’s running this program are Mike Gazzola and Matthew Behdjou. I’ve looked into both of these guys in the checkout. They are real people and they do what they say they do. You are more than welcome to Google their names and looking at them yourself. The first thing that you get is guidance. Mike and Matt will guide you along the way showing you what you should be doing based on their expertise. You will have access to a tool that helps you find profitable products selling on Amazon so that you can better choose what you want to sell and have a better chance of success. Mike will give you access to his sales funnels that you will be able to change up a bit and tailored to fit the product that you are selling. And besides help from the creators directly you also have coaches on your side. According to Mike, all of the coaches in this program have generated 6+ figures on Amazon, so they know what they’re talking about or at least that is the hope of it. There or lots of reviews on both sides of the fence. People seem to like it and then there are many people that seem to have lost money buying into this training program and are against it. But this is something you will find with just about any make money online product/program out there. Not everyone succeeds and in industries like this, success is largely dependent on the work that the individual puts in. There are some extreme cases of failure that you should be aware of. I found some good personal reviews on Quora, one of which was from a guy that claims to have lost over $18,000 from this program. How is this possible? Well after paying several grand to buy into the program he then spent the money to purchase products in bulk from China and have them sent to the Amazon warehouse. Little did he know that the products infringed on a copyright and he then got sued over the whole thing. According to him he claims that Matt guided him through the entire process and kept telling him that the product he had selected to sell is going to be great. There also some other negative reviews out there, such as ones about the character of the two creators themselves. Apparently this one guy worked for them as a translator in China and claims that they are complete assholes, thinking that they are better than everyone and constantly putting others down. He claims that there are only good at suckering people into their program and leading them on thinking that they will strike it rich. One thing that you should always do before buying into a program like this is taking a look at the disclaimer. Even if the program is a complete scam, which I’m not saying this is, they will usually have an honest disclaimer telling you that the program is a bunch of BS or something along those lines. When I was on this website the disclaimer was plastered at the very top of the sales page which was nice because it is right out in the open for everyone to see. It states clearly that “typically/on average most people will not recoup their investment with the strategies”. Just let that sink in for a minute… You more than likely will not recoup your investment. On the upside, at least they’re being honest. It is better than many other disclaimers I have read that still kind of mislead people. Now whether or not this is a scam largely depends on your own opinion and how you define what a scam actually is. In my opinion this is not a scam. I do believe the success stories out there and that some people are making good money on Amazon with what they have learned and have been helped with in this program. Am I crazy to think this? Absolutely not. I was involved in a e-commerce business training program a while back that cost around $3000 (100K Ultra by Aidan and Steve) that I did not succeed with. However, there were people that did succeed and went on to make really good money with their little e-commerce stores. I have been involved in making money online since 2015 and I have come to know that just because something doesn’t work for one person doesn’t mean it doesn’t work for everyone. Some people are going to fail… That is just the way it is. I do think that Mike and Matt could be a little more straightforward with what is going on here. They do over-hype this program and use some “shady” marketing tactics to lure people in, which I think they should do away with. But overall the program is definitely not a scam. Is it worth your money? Should you take out your wallet and throw several grand into it? This is something you are really going to have to think long and hard about yourself. You are also going to have to consider the fact that you will have to invest additional money up front into the products that you’re going to be selling. I am neither going to recommend nor go against this program. If you want to join then go ahead and do so, just know what you’re getting yourself involved in and know that there is DEFINITELY no guarantee that you will be successful. Just as the disclaimer says… Most people will NOT recoup their initial investment. So if you have some money to play with and are afraid to take some risk then this may be something you want to consider, but if not then I would avoid it. It has nothing to do with selling products on Amazon, but if you are looking for a much more affordable and much less risky program, that I would say is overall better for beginners, then I would suggest taking a look at Wealthy Affiliate. Wealthy Affiliate is the program that I got involved with back in 2015 when I first started looking to make money online. But anyway… If you think affiliate marketing would be something you might like then Wealthy Affiliate is definitely the way to go. They provide the tools and training necessary to be successful in this business. You can read my Wealthy Affiliate review by clicking the button below to learn more. If you have your own review of Amazon Secrets then I would appreciate it if you left it down below in the comment section. I am also sure that other readers could benefit from what you have to say. My Ecom Club Review – Scam Program or Can You Really Make Good Money With This? My Ecom Club is an ecommerce training program created by Rocky Lin that supposedly can teach you the ropes and get you set up with your own little ecommerce store to make money online with. But is this program really any good or is it something that you should avoid? Is My Ecom Club a scam that is just going to be a waste of your time and effort? In this review I’ll be giving you my honest opinion of the program and going over some important things that I think you should know. I’ll be giving an overview of what its all about and what it includes, how the method it teaches works, a little background on the creator, what other people are saying and more. My Ecom Club is an program that teaches people to make money in the realm of ecommerce. Not only does it provide training but it also provides tools and, if you pay enough, a partly done-for-you ecommerce website. There are 3 different products/memberships, that are sold here which vary in price and what they include of course. They have the Inner Circle Membership and the Gold Membership along with the Instant Ecommerce Website Template. The Gold Membership costs $97 and is what you need if you are new to all of this. It provides the tools and training to get your ecommerce business up off the ground. From what I have read from members who have went through it, the training is fairly lengthy and detailed, so that is good. The Inner Circle Membership costs $37/mo and gives you access to the “inner circle”. You will get access to a private Facebook group, be able to ask Rocky Lin and other leaders in the industry questions, and more. This is like the cherry on top. Its the next step of you are looking for an edge that the Gold Membership doesn’t give you. And the Instant Ecommerce Website Template is a service they provide for $37. What they do here is basically design your store a bit and set it up for you. This covers just the basic design so that hopefully it converts customers better but is not a completely done for you service by any means. I was involved in ecommerce for a little over 2 years and just closed my stores recently due to having too much going on and them not being profitable enough. I got started with some top-notch training from Aidan Booth and Steve Clayton, which costed me a heck of a lot more than this by the way…$2,497 I think it was. What do I think about ecommerce and selling from your own store? I think it is a great type of online business and I personally know that you can make a killing doing this. I had several ecom stores running, most of the time they weren’t very profitable but there was a point time I was doing very well. I also know people who make more than doctors and lawyers doing ecom business. Its not easy though. It takes a lot of testing, trial and error. What My Ecom Club teaches is what is called “dropshipping”, which is what I did. This is when you list products on your ecom store for sale but you don’t actually have the products. When someone buys a product from your store you simply purchase that product from somewhere like AliExpress, Ebay, etc and ship it to them. So you are like a middle-man. Its a great method because you keep no inventory and can easily put many different products for sale on your site. I originally came across My Ecom Club after reviewing a scam program called Free Biz Account which lured people in thinking they were getting some free program that was going to make them tons of money only to find out that they were being pushed to buy My Ecom Club’s Gold Membership. So I was suspicious of this all right off the bat. It wasn’t a good first impression. And to make matters worse I read another review which pointed out that Rocky Lin, the creator of it all, was involved in a scam in the past called My Secret Sites. This was an extremely misleading scam that you could buy into to get “secret sites” created for you that would give you complete and automated cash freedom. It had a very scammy sales pitch that was absolutely ridiculous and it was created by Rocky Lin as well. Now I’m hoping that Rocky turned over a new leaf and doesn’t do this kind of thing anymore but its just something worth thinking about. You can form your own opinion from this information. 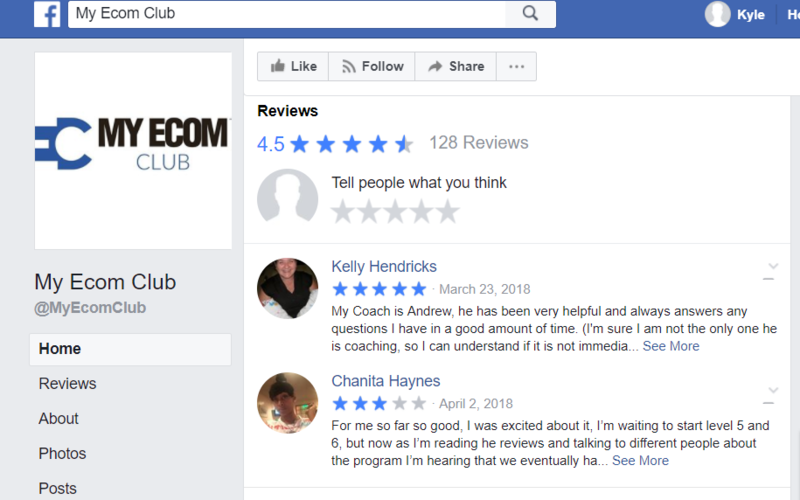 If you go on My Ecom Club’s Facebook page there are a lot of reviews…. over 120 reviews total with an overall rating of 4.5/5 stars, which is pretty darn good. Most people say that the coaches are wonderful and that the training is very good. HOWEVER… there is another concern that I have which I found from reading over member reviews. Apparently the price tag is much higher than the memberships I talked about above. In order to continue with the training at a certain point you will have to pay over $1,000, which is a price that is going to be out of budget for many, meaning that this is going to be a waste of time. Something else that concerns me is that I read reviews from people claiming that you have to refer in other members to continue with the training. I only saw one review saying this but its still concerning. I don’t really know what is going on here but one thing is for sure…. they NEED to be more transparent! Conclusion on My Ecom Club – Good Opportunity or Not? My Ecom Club provides training and tools for what I consider to be a good way to make money online, which I have experience in doing. However there are concerns that I have and need answered before I would be willing to tell people to go ahead and sign up for this program. But anyway… the choice is yours. It appears to be a good program, there are just some little things I worry about and I really don’t care for the lack of transparency here. If you are a beginner to making money online I would actually recommend Wealthy Affiliate over this. Why? Because this is what I got started with back in 2015 and am still a member today. They focus on a different online business model that I think is more suitable for beginners. But anyway, you can read my Wealthy Affiliate review here for more info.